In a recent Universal Music Group showcase, as reported by Billboard, the company revealed their release schedule for 2013 and it was revealed that Concord is planning to unveil their remastered "Wings Over America" in an elaborate package on May 28th. The original schedule for McCartney's remastered series was going to be "Venus and Mars" and "Wings At The Speed of Sound" as well as "Wings Over America", but plans change. I'm still hoping that the other two albums are going to be released along the way somewhere. Also, it appears that the plans to release the 1981 "Rockshow" film from the 1976 Wings concert tour separately from the WOA boxed set has been dropped, and the film is now incorporated into the package.What happens to the television special "Wings Over The World" as far as release plans go, we don't know. However, it should fit in nicely with the "Wings At The Speed of Sound" release, just as snugly as the Australian Wings Concert Special from 1975 would fit the "Venus and Mars" remaster. Any word on when we can get details on that set? 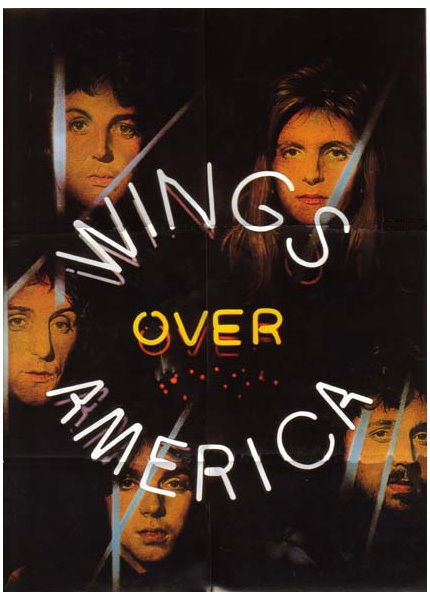 Personally, I think Wings Over America was pushed up the schedule because someone else floated the idea of a Rockshow DVD. This set should carry Wings Over The World as well, since it's connected to the tour. Venus And Mars/Speed Of Sound should be next, with Wild Life/Red Rose Speedway slipping in after that. The real issue with those releases is Speed Of Sound. What was recorded post-Venus & Mars and pre-"Mull Of Kintyre" to fit this set? Wild Life with: Give Ireland Back To The Irish, Give Ireland Back To The Irish (Version), Mary Had A Little Lamb, Mary Had A Little Lamb (alternate version), Mama's Little Girl, The Mess (studio version), Love Is Strange (promo mix), Tomorrow (instrumental) and some live cuts — plus the 1971 rehearsal footage. Red Rose Speedway with: Hi Hi Hi, C Moon, 1882, Best Friend (live), Night Out, Thank You Darling, Loup (alternate mix), Tragedy, Henry's Blues, Seaside Woman, Jazz Street, Rudolf The Red-Nosed Reggae, I Lie Around, Live And Let Die, The Mess (live version), — plus the James Paul McCartney TV special. And Brian.......Speed Of Sound, with Let E'm In rehearsal?? keep your day job! i thinks that these re- issues are running out of gas..